It's not always popular to post negative stories about commonly consumed and highly touted foods like cow's milk. But I felt bamboozled when I read all the research and discovered the negative effects of dairy on my health. I always believed cow's milk was the best milk to consume. How could I have been so misled? From 1956 until 1992 The Unites States Department of Agriculture nutrition guidelines recommended milk in their basic four food groups which included milk products like cheese, meat, bread, and vegetables. Other foods recommended to round out our meals included butter. During that time, the milk industry ran advertisements that said the calcium in cow's milk can help prevent stress fractures and broken bones. They put the fear into us. We thought if we didn't drink our milk, our bones would become brittle and crack like dry twigs. Especially as we aged. The irony is that many scientific studies now show that cow's milk actually has a negative effect on bone health. Researchers in Sweden published findings in the British Medical Journal showing that women who drink milk have a higher incidence of bone fractures and an increased risk of mortality. Dairy products can also be high in retinol (vitamin A), which at high levels can weaken bones. According to another study, women who consume three or more glasses of cow's milk per day has a 60 percent increased risk of developing a hip fracture and a 93 percent increased risk of death. And each glass of milk increases mortality risk by 15 percent. Calcium is important, but that isn't the whole story according to The Physician's Committee For Responsible Medicine. Cow's milk, meat and other high-protein foods can actually cause the body to lose calcium. To protect your bones you do need calcium in your diet, but you also need to keep calcium in your bones. The PCRM says the most healthful calcium sources are leafy greens, legumes, cruciferous vegetables and calcium-fortified beverages like almond milk or orange juice. So the best milk to drink isn't from a cow. The good news is, there is no reason to miss cow's milk. There are so many delicious non-dairy milk alternatives that don't have casein, pesticides or saturated fat. My favorite is almond milk. 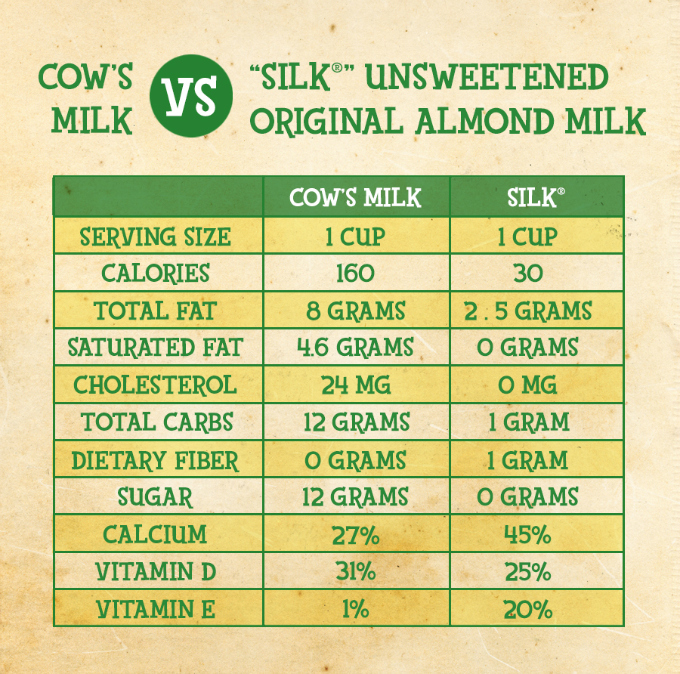 My go to brand is Silk unsweetened original almond milk. I use it in coffee, vegan cheese, alfredo sauce and all my baking. What I like about the Silk brand is that it is 30 calories per serving, with no added sugar. It also contains more healthy calcium and vitamin K than cow's milk. If that wasn't enough, it is also non-GMO. You can sign up for the Silk newsletter here for recipe ideas. Here is there store locator just in case you are having trouble locating Silk products. The next time you go shopping, choose the best milk to drink. Non-dairy, low-fat, sugar-free, lactose-free, pesticide free, non-GMO almond milk. I promise it will be one of the best decisions you can ever make. Don't miss any of Ordinary Vegan's free recipes by signing up here. Learn more about health, wellness and nutrition on my newly launched podcasts here on my website or in iTunes.